St. Lucie, FL — The KinderVision Foundation and the Florida Department of Juvenile Justice are pleased to announce that Centennial High School has been named the high school statewide winner for The Greatest Save 2017 Teen PSA Program in Florida . Centennial High School student Victoria Edouard created the winning PSA entitled “Too Easy” with the help of fellow student Chloe Ramos. Victoria’s video shines a light on the large percentage of teens who are lured into meeting predators via online conversations. 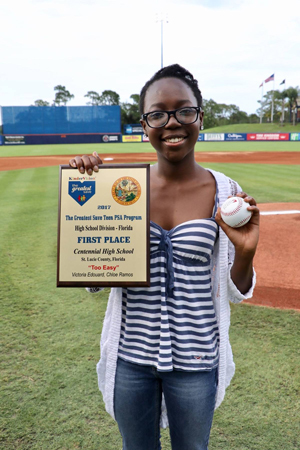 The St. Lucie Mets invited the winning students and their teacher Allan Newton to take part in a pregame ceremony at the ballpark to recognize them for their efforts to keep teens safe. 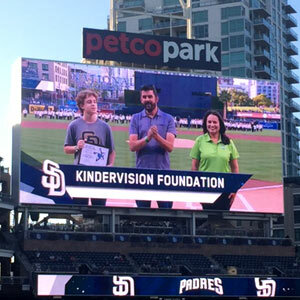 KinderVision Foundation Executive Director Nancy Sebastian said, “The Greatest Save Teen PSA Program promotes positive peer pressure while giving students a platform to present issues that are important to them. Allan Newton, the video teacher from Centennial High School, has been a strong supporter of this program for several years and does an outstanding job in presenting it as a class project to raise awareness. We applaud him and his students for being part of the solution to end teen victimization.” The year culminated with the effective delivery of over forty million student PSAs to schools in the thirty funded Florida counties. 1 in 7 youth will be sexually solicited online. The Greatest Save (TGS) is a program of the KinderVision Foundation, a 501c3 charity created in 1991 and a recognized charity of Major League Baseball (MLB). The Greatest Save Teen PSA Program is in over twenty MLB cities nationwide. Law enforcement has endorsed KinderVision’s mission to empower children and teens through education to prevent victimization, especially exploitation, abduction and human trafficking. To see the Centennial High School’s winning video, visit www.TeenPSA.org. To get your school involved, request information using the email listed above.